(Phys.org) —For only the second time in history, a team of scientists—including Carnegie's Michele Fumagalli—have discovered an extremely rare triple quasar system. Their work is published by Monthly Notices of the Royal Astronomical Society. Quasars are extremely bright and powerful sources of energy that sit in the center of a galaxy, surrounding a black hole. In systems with multiple quasars, the bodies are held together by gravity and are believed to be the product of galaxies colliding. It is very difficult to observe triplet quasar systems, because of observational limits that prevent researchers from differentiating multiple nearby bodies from one another at astronomical distances. Moreover, such phenomena are presumed to be very rare. 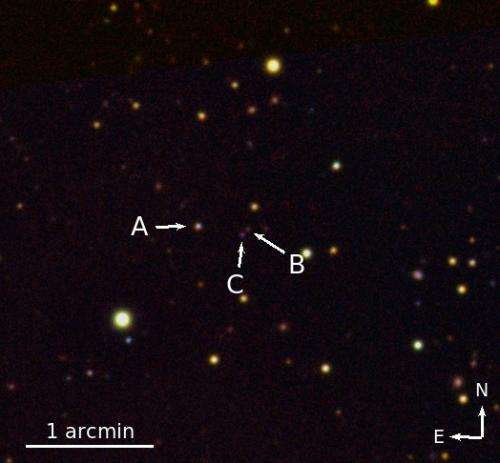 By combining multiple telescope observations and advanced modeling, the team—led by Emanuele Farina of the University of Insubria in Como Italy—was able to find the triplet quasar, called QQQ J1519+0627. The light from the quasars has traveled 9 billion light years to reach us, which means the light was emitted when the universe was only a third of its current age. Advanced analysis confirmed that what the team found was indeed three distinct sources of quasar energy and that the phenomenon is extremely rare. Two members of the triplet are closer to each other than the third. This means that the system could have been formed by interaction between the two adjacent quasars, but was probably not triggered by interaction with the more-distant third quasar. Furthermore, no evidence was seen of any ultra-luminous infrared galaxies, which is where quasars are commonly found. As a result, the team proposes that this triplet quasar system is part of some larger structure that is still undergoing formation. "Honing our observational and modeling skills and finding this rare stellar phenomenon will help us understand how cosmic structures assemble in our universe and the basic processes by which massive galaxies form," Fumagalli said. "Further study will help us figure out exactly how these quasars came to be and how rare their formation is," Farina added.